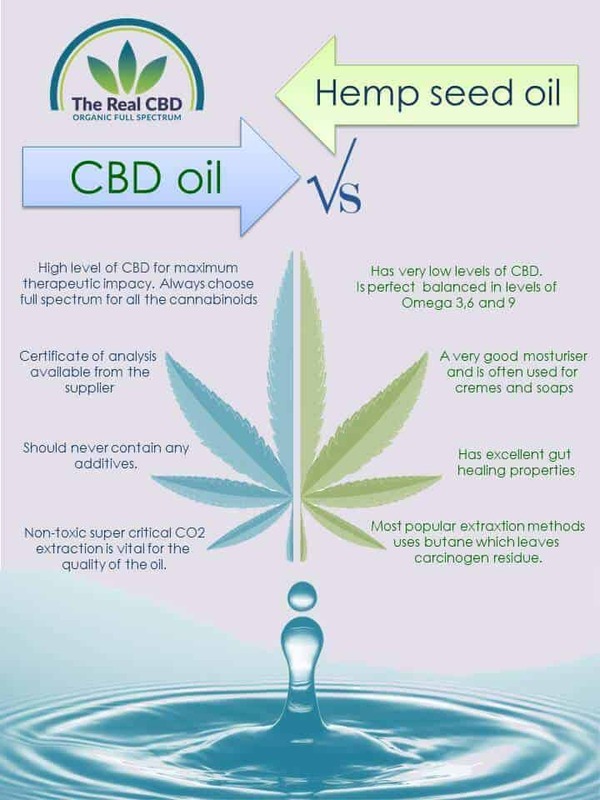 While they are similar in some ways, there are important differences between hemp oil and CBD oil. As a consumer, it’s easy to get confused by phrases such as “cannabis oil” and “marijuana oil,” especially when many companies seem to use these terms interchangeably. Let’s take a closer look at hemp oil and CBD oil to learn how to distinguish the two. Hemp oil is fabricated from the plant called hemp. In other words, it is a hemp extract taken from the seeds of the plant. While this type of oil can be extracted from all plants in the cannabis genus, industrial hemp is the only plant used for hemp seed oil. This type of hemp is specifically produced industrially and the amount of psychoactive substances that are contained in it is next to nothing. Hemp oil is great for cooking and a full of nutrients. It can provide a crispy and nutty taste to foods and can be a wonderful replacement for olive oil in salads. It is a great natural moisturizer that can be used after a shower. Hemp oil can be the base for different forms of plastic, instead of petroleum. It is used in the production of paints that are more eco-friendly than petroleum-based paints. It can be used as bio-diesel fuel, like other vegetable oils. Hemp oil is used for making lotions, soaps and even some foods. CBD oil is the short form of the term cannabidiol oil. Cannabidiol is a natural component of industrial cannabis or hemp. CBD oil is cannabis oil that has a significant content of cannabidiol. It is made from the flowers and leaves of hemp and not from its seeds like hemp oil. CBD oil has become very popular in the medical marijuana industry because it can be helpful in the treatment of various conditions without the typical intoxicating effects of marijuana use. Can be used in the treatment of cancer. It is used in the treatment of inflammatory disorders, anxiety, depression, seizures and neurodegenerative disorders. Can be used in the treatment of epilepsy. Hemp and marijuana are cousins in the plant world, but marijuana has a much higher THC content than hemp. CBD oil extracted from the hemp flowers and can contain up to 25% CBD. Because the plants are related some unscrupulous sellers of hemp seed oil will call it Hemp oil, CBD oil or even Cannabis oil and are trying to market it for its medicinal value, which is negligible. So before you invest in anything, ask for a lab test to prove the product has all the cannabinoids, if it is sold very very cheaply or given as a free sample – It is for sure HEMP SEED OIL, whatever the label says.